Does anyone still buy and use THIS anymore? Came across this item in the store (or set of items rather), plus expansion packs for it. Seems pretty good (I've certainly thought of putting a couple Vikings in my scenes), except it's supposed to be only useable with the oldest of the Michael figures. Is there any way to use it on Genesis? 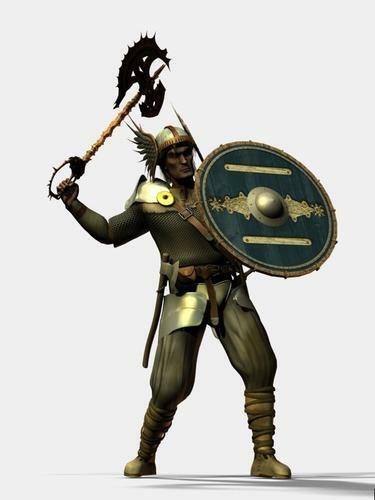 I don't seem to find any 'Michael 2 shape for Genesis', which I understand would enable me to apply the Viking onto Genesis. It would seem odd (and a waste of space) that DAZ should still carry items like this in their store if those items are not going to be useable anymore. Wouldn't someone come up with updated versions of them? Or is there a way to use them on Genesis (or Michael 3/4) which I don't know of -- besides that 'Crossdresser' thing? Thats a cool item. I like the padded armor. I wonder when I see items like this, especially ones that are this expensive. It seems to me the dated stuff should be phased out, and priced lower.... I see it all the time in the store, where a gen 3 item costs more than a gen 5 item, and I've got tow wonder, really? do you think people are going to buy that at that price... I guess maybe, if you were still using an early software package, you might have a use for it, but the cost... Wow. Some of the pricing does seem odd. She-Freak V4 and V3 both have retail prices of 29.95, but the PC prices are 1.99 for the V4 version and 17.97 for the V3 version. You would think they would be the same price. In the past Poser content was more expensive, and yes some people still use the earlier figures. It is also up to the vendor, not Daz, to change the pricing. To use it on Genesis you would need to convert it to Michael 4 then autofit it to Genesis; I have no idea how this would work. To lower the price would be John Malis decision - and I haven't heard of him in a loooooong time (pity!). 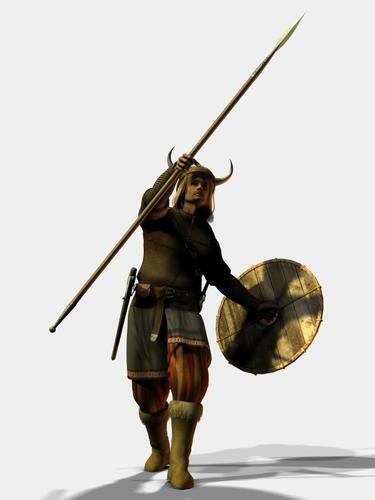 One wonders if the creators of the Viking pack are still around anymore or have left DAZ 3D. My suspicion is that they've left. Surely if they were still around it would have occured to them to update their item so it could be used for Genesis, just as Jepe updated his M4 morphs (Jonah etc) to be useable for Genesis too. The people who started into 3D early still have their old figures and tend to use them for background characters since they are (I am told) lower poly and easier on the resources. This is particularly helpful when one has an older computer. I very much like the look of that artist's work. Back with DS3 I'd have fitted that one to M4, turned the figure invisible where adjustments couldn't get rid of poke through And been careful of the camera angle. Probably still could with M4. Genesis has to be different, though, and doesn't seem to let you ignore autofit and just use old-style "fitting" on clothing items. ETA: I'd happily pay for a pack of clone figure models for auto-fit for older Gen2 figures and the Gen3 kids, none of which have autofit clones. Just cancel the autofit when it pops up or don't have Genesis selected when you load the clothing in. 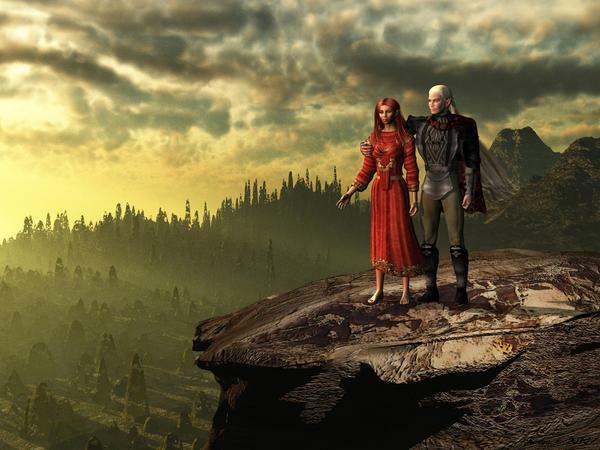 Poke through in DS4 + can be dealt with by using the smoothing Modifier. I doubt there's too many people still doing photo realistic renders with M3 or below anymore. Maybe some toon rendering stuff. And I'm sure tons of people are still using them for artistic reference. I still use Gen 4 since I only work in Carrara 7 Pro. I don't see much of a difference between a C8 Pro render of a Genesis figure and a C7 Pro render of a Gen 4 figure. Actually, there's an M2-to-M3 figure that came with M3 that allowed you to use your M1 and M2 clothing on M3. 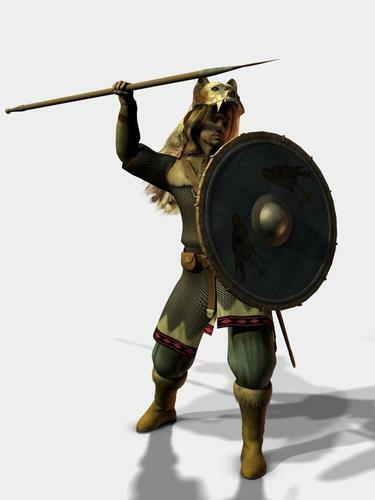 I have converted pants, tunic and wolf pack from Viking Pack for Michael to Michael 4 using Crossdresser. and I have not found the way to avoid distorsions, so far. Tunic also get easily distorted in different poses. Click the image to see it enlarged. But DAZ also sells the Anime Star Fighter Bundle, which consists of those 3 items, for $0.00. There are PAs who aren't active anymore, but even if they only sell one or two items a month that's still money in their pocket at the end of the day. But if they aren't active, then updating for Genesis becomes a much more complex task because there are whole new technologies to learn. Even if someone is active, the anticipated return from modernising a piece of clothing isn't necessarily going to be the same as creating something new - people have an inbuilt reluctance to buy something they perceive themselves as already owning - so a new outfit may have a much better return on investment. 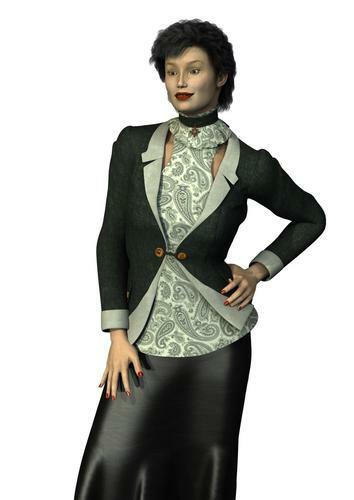 And there are plenty of people who own one of the clothing converters and could bring the garment over to 4th generation, making it accessible to Genesis - it is not just the Cross-Dresser users, anyone who has bought any of the last several versions of Poser has access to Wardrobe Wizard. The John Malis stuff is good, it's still some of the best historical costuming out there, but pricing is an issue. I strongly considered buying either the Vikings pack or one of the role-playing packs during the PA sale (I already have the Fighter-Adventurer one), but in the end decided I couldn't justify it even at the reduced price. But pricing is the PA's decision to make. As for why people work with the older figures, why not? Some of my favourite character morphs are for older figures. This is something I whipped up a month ago with V3 and the quality isn't obviously different to what I'm getting with Genesis. The product detail page for that is incorrect. The Viking pack was M2/M3 ( I have it, use it, and just checked the readme that installed when I installed it many years ago). They still look quite nice, and mix well with other figures from John Malis's fantasy and historical sets. Obviously, some work needs done to get raytraced materials as these were made before Poser had firefly. They are still wonderful sets. The Viking Pack can be used for M3? Materials are usually of secondary concern for me...if an item has some nice basic materials, fine. But more often than not, I tweak the heck out of them any way. I have used it on M3 (unless John Malis had another Viking set that I am getting mixed up). Some of the props might need slight adjustment, but I have auto-conformed the clothing. I can post a render later tonight sometime when I have time of some M3 characters using the Viking Pak for reference. Ok, here we go, sorry for the delay. All of the images that follow use CDI Brom for Michael 3 as the base model. No magnets, no crossdresser, no Wardrobe Wizard, just loaded the clothes and conformed. Some of the props needed to be slightly repositioned, and in the case of helmets, slightly rescaled in some cases. 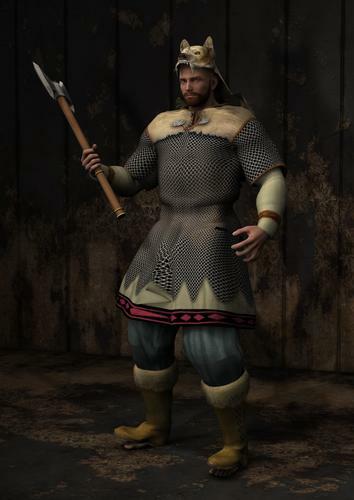 The first image is all Viking Pack with textures from the either the Viking Pack, Saxon Expansion, or Norse Villagers expansion (I mixed and matched textures when I made these guys). The Axe is from one of Aery Souls kits. 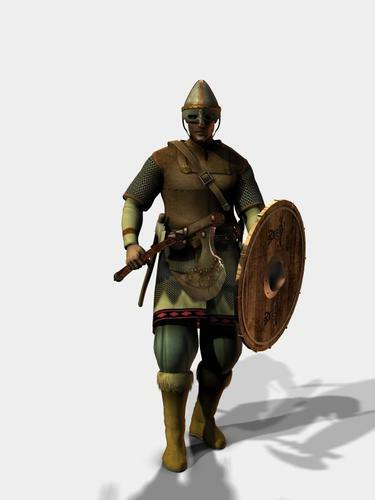 The 2 Spearmen use only items from the Viking Pack and textures from the three mentioned sets. The final image also uses some armor from 2 other M3 sets (knight Erant being one) and an Axe from Poisen, and the helm from the Valkyrie Pack (rescaled). There is some minor pokethrough sometimes, but I usually turn off visibility on parts hidden by clothes as a matter of course which alieviates this (the feet are the main issue). There are no included hand poses for the weapons or shield for M3 (couldn't find the M2 ones either) and you may need to slightly reposition these props, and things like bracers and helms. The conforming clothes themselves seem to work just fine though.